Bathroom designs are myriad but one needs to choose the right kind of design that suits his personality and that of his bath area too. When we speak of bathroom design ideas, the color yellow plays heavily on our minds as this is one color that not only makes a decor lively, it also adds richness to it. Yellow tones can be useful in enhancing the oomph factor of your bathing chambers as yellow is a color that invokes passion too. It is the most romantic color to accentuate the look of your bathroom. For those that are looking to create a charming bathing space can look at the post that will list down the top 18 cool yellow bathroom designs. 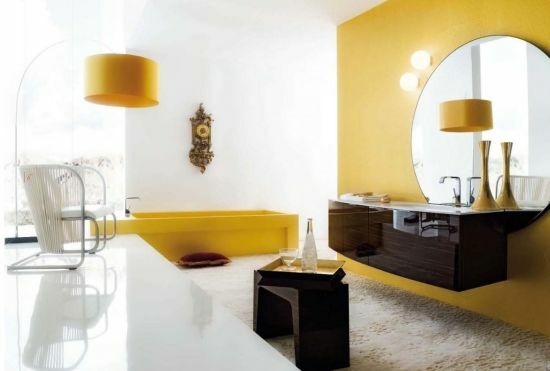 Yellow bathroom designs such as the one seen in the image looks stunning with a retro look and feel. The bright wall behind the white bath tub is painted in stark yellow tone and along with it, the designer has fixed two trendy looking hanging lamps, also in yellow. The look of the bathing area is electrifying and very appealing to the eyes. Matching with the whole yellow theme is a black wooden framed painting with imprints that look very chic. One can feel relaxed taking bath in this awesome looking bathroom that has been decorated using bright yellow accent against a black toned ceiling, offering a good contrasting effect to the decor. The color combo of yellow and black sets the mood for a relaxing time spent in the bathing chamber. The bathroom appears more like an extension of your living area since one can see a balanced placement of accessorizes that have been anchored to make your bath time memorable. The black furry rug creates a style statement and so does the eclectic wall art. The first thing that greets anyone who enters this modern bathroom is the beautiful yellow painted wall that appears quite attractive and makes you feel at home in an instant. To compliment the decor of this bathroom, there is installed a yellow colored pendant lampshade, adding the required curves to the interiors! 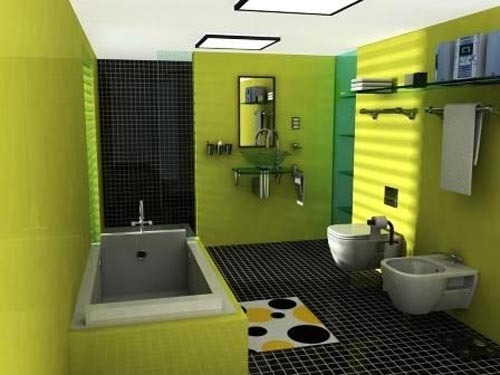 Such yellow bathroom design ideas are gaining popularity as one can feel cheerful and happy when spending time here. 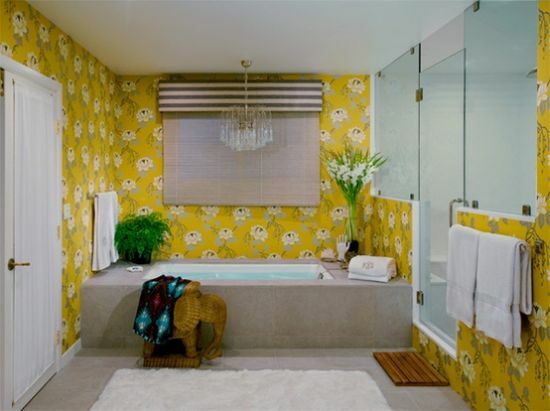 Another feature to gain our attention would be the yellow colored bath tub that exudes a retro feel. These days geometrical shaped accessories are increasingly being adopted by designers when decorating homes, and bathrooms too fall in this category. The image below shows a trendy looking bathroom where the walls have been patterned with geometric shaped open cabinets and yellow blocks that help in bringing out the powerful contrast of light and bright efficiently. Many bathroom design ideas are inspired by geometry since these shapes add a touch of fun and cheerfulness. Yellow accents blend efficiently with earthy tones like browns as we can see in the powder room below that boasts of a decor with natural tones splashed on the terracotta finished sink. 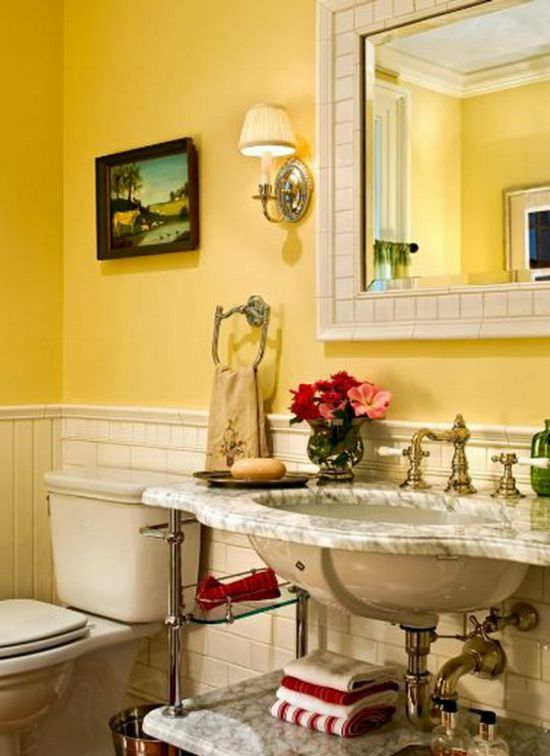 The sink is bordered with yellow patterns that offer a traditional look. 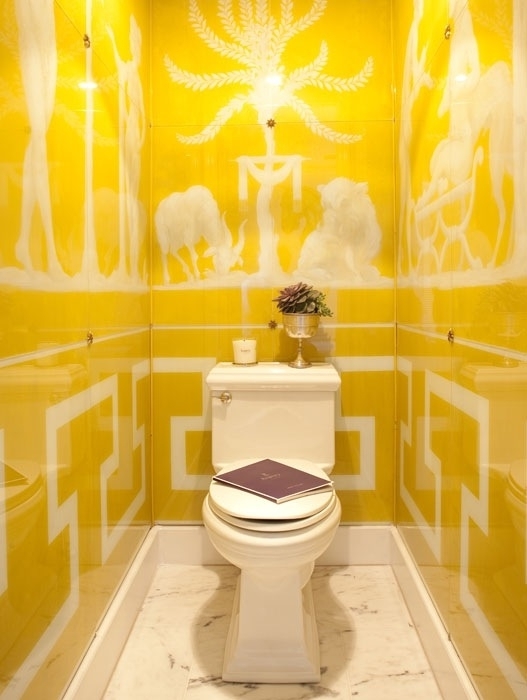 Also, the pillar holding the sink bears a design that is carved using yellow tones. 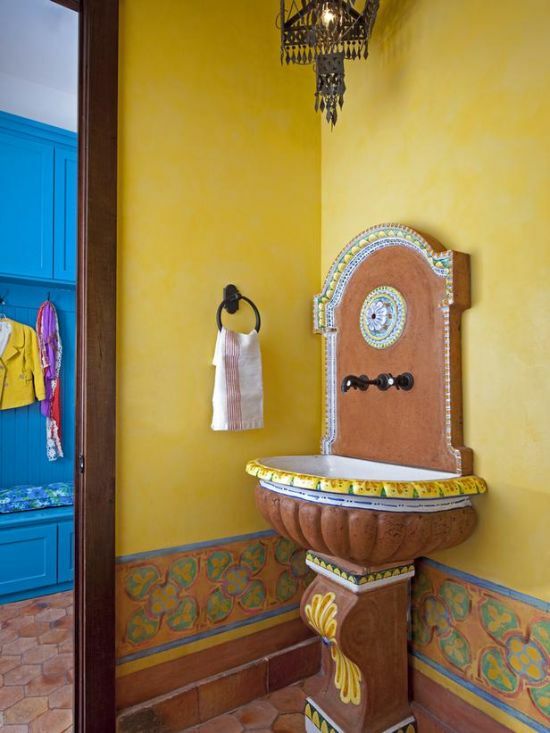 The bathroom appears quite glamorous with yellow painted walls and the rustic terracotta sink. Yellow is one such color that helps in rejuvenating the mood and helps being a refreshing change to even a bland looking bathroom. The image here shows a bright looking bathing area whose walls are painted using dark yellow tone that creates a rich look and makes the space appear bigger and comfortable. The shades of white and light wood blend well and manage to liven up the decor. 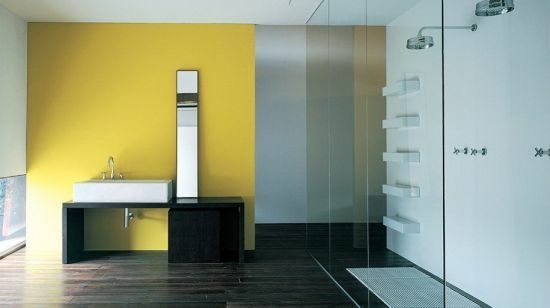 Yellow bathroom design ideas imbibe a variety of tones, some light, while others are dark. However, the cool yellow tones present in the bathroom below help in creating a happy mood without the interference of the black accents that we can see splashed on the tiled wall and the shiny tiled flooring. Light yellow tones on the wall and on the outer body of the bath tub match well and offer a good combo with black. 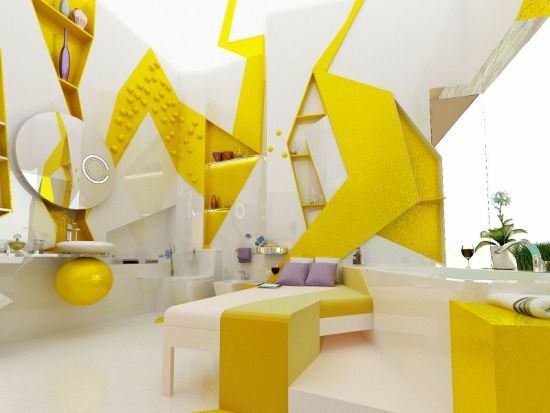 Wall designs or art can alter the look of any room, and your bathrooms too can look exceptional with a yellow and white color wall design such as the one seen in the picture. The wall design is a favorite among customers that look for home staging or bathroom renovation. Bathroom design ideas such as this one adds glamor to the settings of a bathing chamber and make the whole atmosphere cheerful. On the walls is seen imprints of animals sitting under an enlightened tree that lends a bit of spiritualism inside. Bathroom designs involving lots of yellow accents help revive the look of a bathing chamber and make it a place that is worth spending some precious moments. 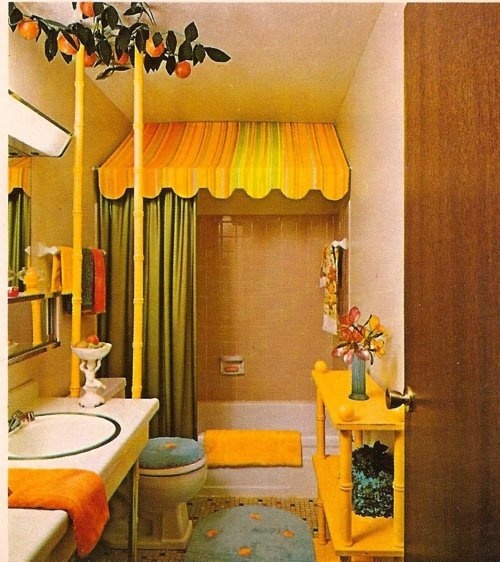 The bathroom here looks sunny with lighter tones of yellow splashed all across, on the table, the shower canopy that is designed with yellow and green strips and the fluffy bathroom rug spread on the floor. With a dazzling bathroom such as the one here, I am sure the owners would never allow the space to get dirty since it is a heaven that is fit for dwelling by gods! Yes, the whole decor is dipped in tones of yellow that makes it a sunny place that cheers you up with its metallic yellow shower cubicle, the black and white floral imprinted yellow accented walls and flooring. The tiling in the bathroom steals the show with yellow offering a good backdrop for the black and white accents. The one striking feature to grab our attention has to be the effective contrast created by the dark grey floor of the bathing chamber with that of the brightly painted wall in yellow. The color combo is awesome as it succeeds in creating an elevating mood once you enter the interiors. 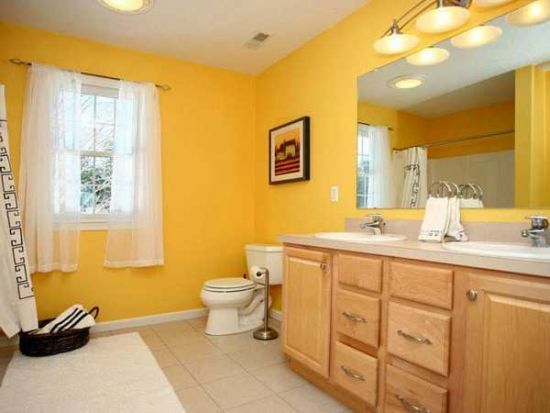 Behind the yellow wall is stationed the bathroom vanity with white sink and a longish mirror. 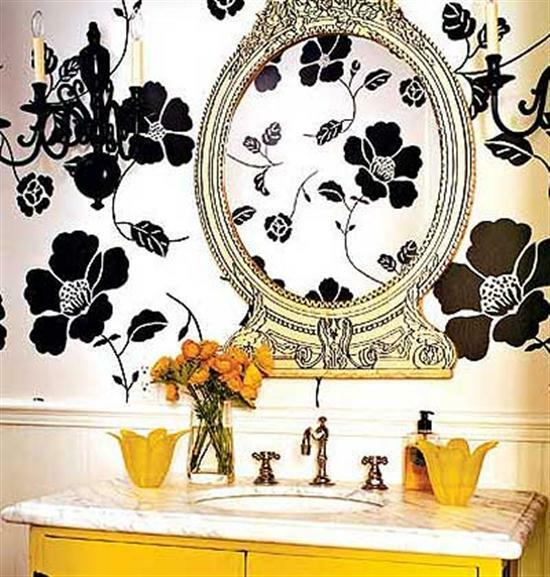 The highlight of the whole bathroom are the beautiful walls decorated with yellow colored wallpaper. The wallpaper has images of white and green flowers on a bright canopy of yellow tone. This creates a happy feel inside and makes the area seem bright and sunny. The green plants anchored just near the tub add to the charm of the bathroom. 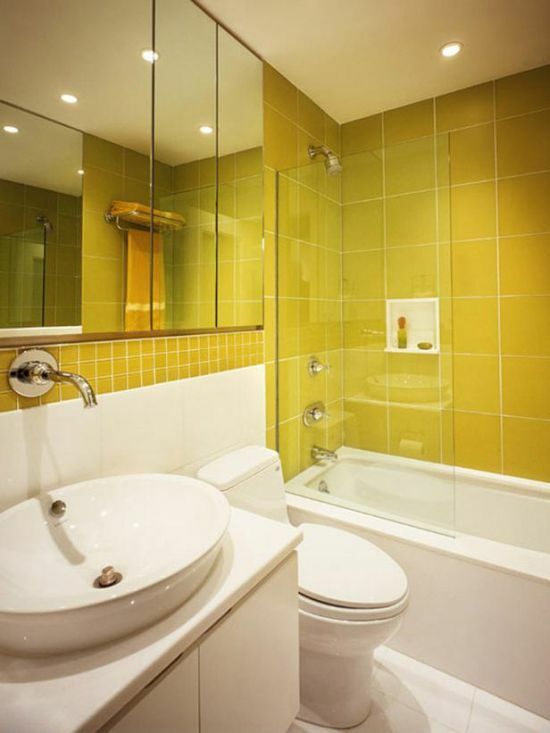 One can do wonders to their bathrooms using vibrant yellow tones everywhere, from walls, cabinets, flooring to various other accessories to add glow to the decor. 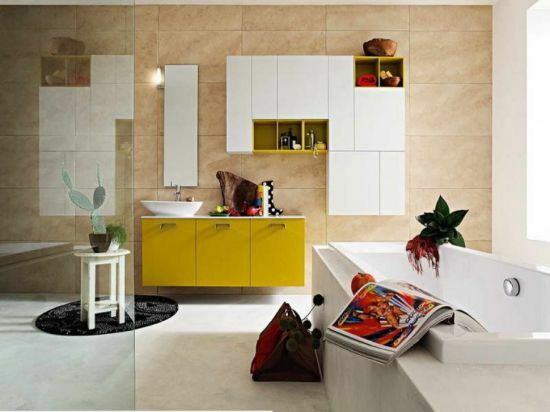 In the image is an elegant bathroom that has taken inspiration from the latest yellow accented bathroom design ideas. The walls are seen painted in light yellow tone while the flooring is plastered with patterned yellow tiles. The look of the bath area is lively and fresh. What seems more alluring, the bright yellow panels of the single sink vanity or the white floating cabinet installed in the bathroom? I must say that both these features combine to create an astounding look for the whole decor that seems to enjoy a uniform blend of white and yellow accents splashed elegantly all over. The bathroom seems to have a character of its own with trendy accessories fitted everywhere. 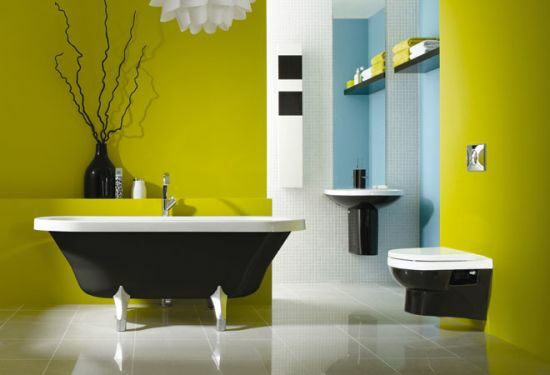 Have you ever wondered what greenish yellow tones can do to your bathing space? Well, these can actually lift your spirits as the light tones of yellow have a positive impact on your minds. The light yellow tiled walls are big and this lends a feel of greater space to the interior. The designer has used yellow accents in such a way that these have a mellow feel to the decor and do not really poke your eyes with starkness. Black offers a perfect contrast to any lighter tone like yellow, and this helps in cheering up the whole room. On entering this awesome bathroom, you get greeted by a brightly painted greenish yellow walls that spread a mood of cheerfulness all around. The yellow walls appear to look even more gorgeous with black colored accessories and fittings like the black shimmering vase, the western toilet and the bathtub whose rims are bordered in white. Styling your bathroom as per yellow bathroom ideas can help add an exhilarating feel to it since yellow always succeeds in livening up the spirits and prompts one to feel energetic. The canary painted console of the sink here looks amazing and a visual delight, without being too overwhelming. Matching with it are yellow floral pots and a bunch of roses arranged for maximizing its appeal. The half painted walls of this bathroom where the lower half is designed with white tiles, and the upper part is painted using light yellow color helps in accentuating the rich look of the space. The yellow tones used are such serene that your eyes do not get overwhelmed seeing the brightness. 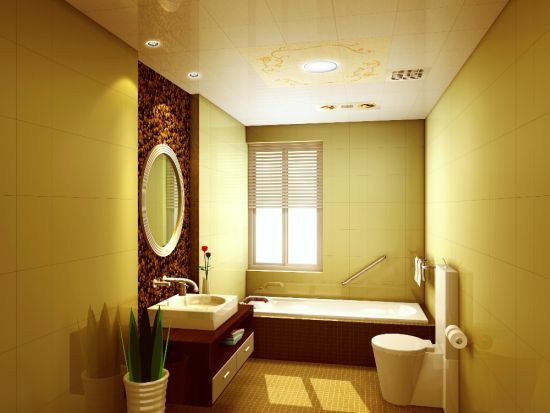 The bathroom design ideas imbibing such elegant tones of yellow help in uplifting one’s mood. The textured sink looks grand against the bright yellow wall. I am sure you all must have fallen in love with these awesome and cool bathroom design ideas that have yellow as the prime color to coordinate the look of your bathroom’s decor. This is one color that is energetic as much as it is elegant. You can see for yourself how such yellow tones can bring about a sudden change to your bathroom’s appearance and then take help of this post to select a few. I bet you will fall in love!